The Lopi Greenfield Stove | Green Smart | Two is pioneering a new stove design. This Greenfield gas stove fuses traditional cast iron with clean lines. It can be used as a freestanding fireplace! The Greenfield has many features. Perhaps the most awe-inspiring is the large 553 square inches of fire-viewing ceramic glass. The glass comes complete with the ANSI approved invisible safety screens. The stove sports a 3 sided glass design that allows you to enjoy the dramatic fire display from every corner of the room. The prize winning Ember-Fyre™ burner is also a great feature, with its high-definition log set. Another amazing feature of the Greenfield is its adjustable accent light which brilliantly emphasizes the log set and stove interior. The accent light can be used regardless of if the heat is on or off. 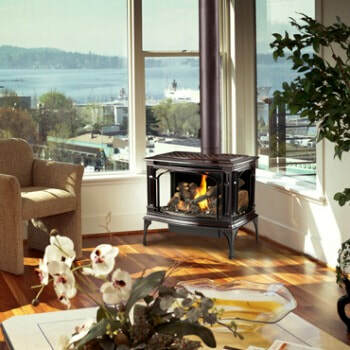 The Greenfield is a powerful heater, producing up to 40,000 BTUs and heating up to 2,000 square feet. This stove has an incredible control over the heat output; in fact it has a turndown ratio of 70% on natural gas and 82% on propane. Control every function of this stove from your couch, with the GreenSmart 2 Wall Mounted Remote and Green Smart gas system. ﻿If the project is outside of Southwest Montana please visit the Lopi site for dealers that may be near your area for a price. Bare's may only sell these products bought and picked up from our store locations. Please understand we are unable to ship, sell, deliver, install, service or provide warranty for items outside of our area.